The slowdown in China’s cities has influenced the index’s overall performance this quarter, but some Indian cities are rising up the rankings says Kate Everett-Allen. The index increased by 6.1% in the year to June 2017, down from 6.9% last quarter. This marks the index’s first decline since the start of 2016. The number of cities registering annual price growth above 20% has fallen from 12 to nine in the last three months, with Chinese cities less dominant at the top of the rankings. Last quarter, seven of the top ten rankings equated to Chinese cities, three months on, only three Chinese cities remain; Wuxi, Zhengzhou and Changsha. However, this is a deceleration rather than a crash. Prices are still rising on a year-on-year basis in all twenty of the Chinese cities we track within the index. The outliers have reduced in number and the lower tier cities are now outpacing cities such as Shanghai and Beijing, which have seen the most stringent cooling measures. Long-term frontrunners such as Hong Kong, Reykjavik, Wellington and Budapest are holding firm but this quarter we have seen some new contenders rise up the rankings, most notably some key Indian cities. A year ago, the ten Indian cities tracked by our index averaged 3% annual price growth, today this figure has jumped to 12%. Analysis of key economic and political groupings, from the G8 to BRICs and MINTs, highlights the extent to which house price growth is accelerating fastest in cities located within emerging markets. Cities in the BRIC nations averaged 7.5% annual growth to June 2017 compared with cities in the European Union, which averaged 4.7% over the same period. The number of cities registering declining house prices year-on-year remains static at 27 but European cities are increasingly well-represented at the bottom of the table, particularly those in the southern European economies such as Greece, Cyprus and Italy. Analysis by world region highlights Asia’s outperformance with prices rising by 10.9% on average across the region. 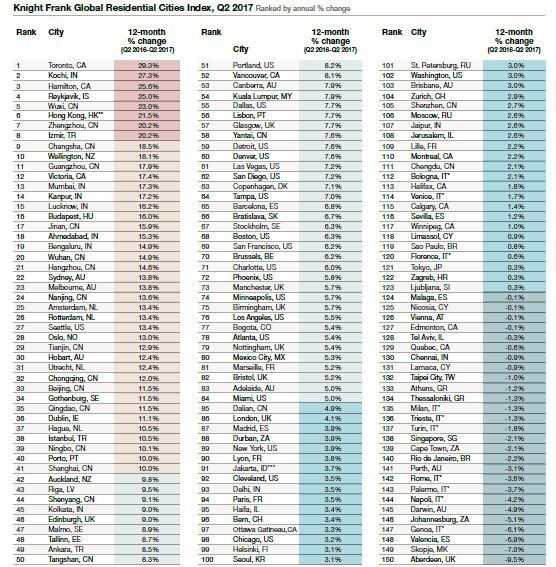 At the other end of the rankings, Africa stands out as the only world region to see average urban house prices decline year-on-year. © Knight Frank LLP 2017 – This report is published for general information only and not to be relied upon in any way. Although high standards have been used in the preparation of the information, analysis, views and projections presented in this report, no responsibility or liability whatsoever can be accepted by Knight Frank LLP for any loss or damage resultant from any use of, reliance on or reference to the contents of this document. As a general report, this material does not necessarily represent the view of Knight Frank LLP in relation to particular properties or projects. Reproduction of this report in whole or in part is not allowed without prior written approval of Knight Frank LLP to the form and content within which it appears. Knight Frank LLP is a limited liability partnership registered in England with registered number OC305934. Our registered office is 55 Baker Street, London, W1U 8AN, where you may look at a list of members’ names.